The “Medallion Workbook Series” is an accelerated general music theory method. 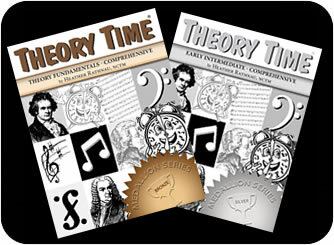 This comprehensive series is designed for adults, college students and late beginners for entry-level music theory study, or as a review text for Advanced Placement examinations or those desiring to get “on level” for a particular workbook in the original Theory Time Workbook Series. There are five workbooks in the Medallion series including Theory Fundamentals - Bronze, Early Intermediate – Silver, Intermediate – Gold, Advanced – Platinum, and College Prep – Diamond. 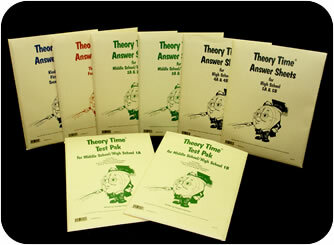 The Theory Time®workbook series is the most comprehensive music theory course on the market! Teachers continuously provide positive feedback on the progress of their students. 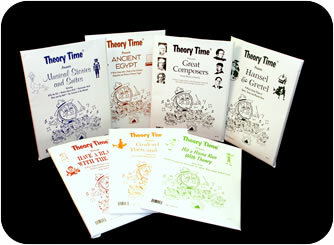 Theory Time®students from preschool to high school are mastering and retaining theory concepts. They love the Fun Sheets and Challenge Sheets which motivate them to do their assignments! 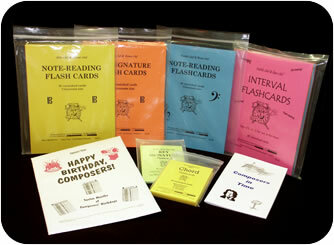 The Elementary Reproducible series consists of seven packets, one for each grade level K-6. The Middle School/High School reproducible series is perfect for band, choir or orchestral programs. This series progresses from beginning through advanced theory in five levels. All lessons are presented in treble, bass, alto and tenor clef and can be used with any music program. Answer Sheets are available for each level of the Elementary and Middle School/High School series. "Test Paks" are available for the Middle School/High School series. Many teachers use reproducible packets of Fun Sheets and Challenge Sheets to reward students for mastering concepts, or to just add more fun to a music program! Fun Sheets and Challenge Sheets correlate directly with grade level packets in the reproducible curriculum series mentioned above. 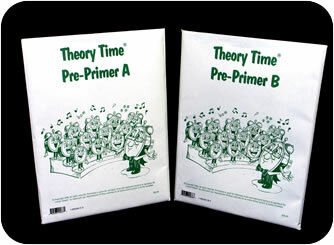 The Pre-Primer series is a music theory course appropriate for students in pre-kindergarten, or for students with special needs. 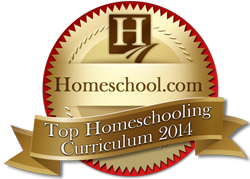 The course offers step-by-step instruction that complements the developmental stages of children, ages three to five. 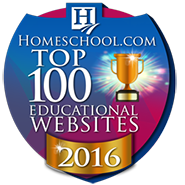 Students of any age that require individualized teaching techniques will benefit from the content and format of this material. These reproducible materials include lesson plans, projects and games that required hundreds of hours of research! Private teachers use this valuable resource to plan summer music camps, or classroom teachers may use these for weekly/monthly composer studies. General music teachers appreciate the composer biographies and listening exercises included in each packet. 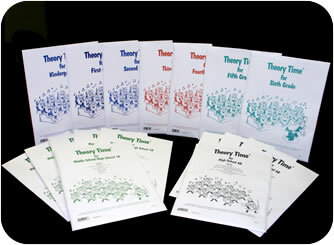 Theory Time® offers small, private-size and large, classroom-sizeflashcards for rhythm (in 3 levels), notes (in 4 clefs), key signatures (in 4 clefs), intervals (in 7 keys), major & minor chords, and musical symbols. The Happy Birthday Composers Calendar provides a special touch for studio or classroom birthday celebrations year-after-year! Student birthdays are recognized beside a renowned composer who shares the same birthday with them. Composers in Time is a quick reference handbook listing composers and musical styles of their era - a great resource for students and teachers! 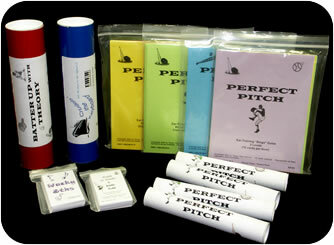 Perfect Pitch Bingo provides an exciting ear training drill! 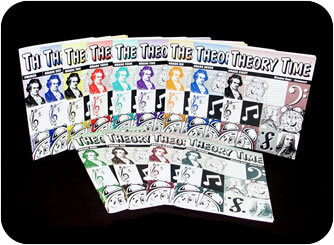 Batter Up with Theory is a challenging theory board game that helps students learn musical terms, symbols, notes, intervals, keyboard, key signatures and scales. Wacky 8ths and Truth or Doubt/Symbol Clash card games require students to memorize and recognize symbols and note values in a split second. Cruisin' the Keyboard is a terrific keyboard interval game in three levels!